Q.1 Define Decision Making and give its characteristics. Ans. : Decision making is the process of choosing or selecting any one option out of several options to achieve some objectives. Allen – “Decision making is the work a manager performs to arrive at a conclusion or judgment”. Thus decision is a process of selecting a course of action from among the available alternatives in order to achieve a desired goal in a given situation. 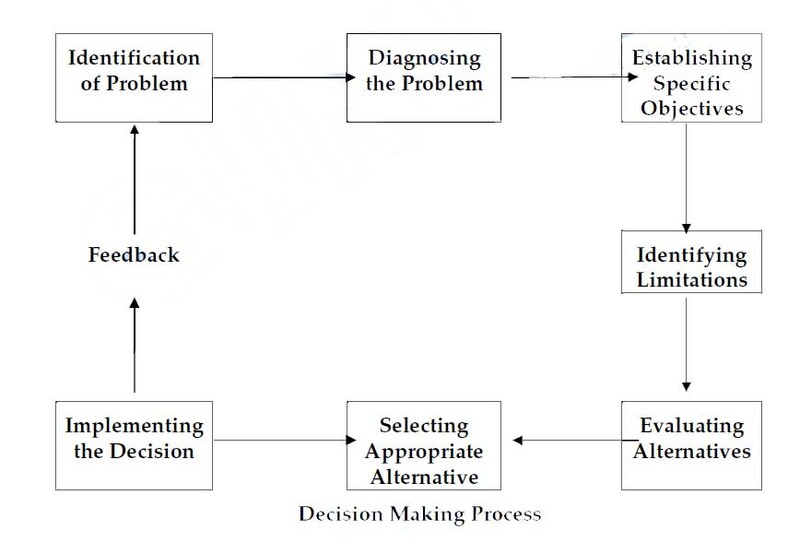 (i) Decision making is a sequential process involves the searching, evaluative and choosing a course of action. (ii) It is an intellectual and logical process. (iii) This process will take place in the human mind. (iv) It is a human and social process. (v) It is largely an intuitive process but can be formally structured. (vi) There is an existence of alternatives. (viii) It aims at attaining some objectives. (ix) Decision is directed to solve some problem. (x) Decision making involves commitment. (xi) It is influenced by environmental conditions. (xii) Decision making is the essence of management. Q.2 Discuss in brief the various techniques of Decision Making. (2) Intution : Intution or hunch is a knowledge based on instant inner feelings or spiritual perception rather than reasoning. It is based on faith. (3) Habbits : Established habits can be used as a technique of decision making. Managers try to solve repetitive and routine problems through their established habits. (4) Standing Plans and Procedures: There are standing plans and procedures in every organization such as policies, rules, procedures, methods etc. They all serve as a technique for decision making. (5) Organization Structure: Organization structure make it clear who is responsible for what and to whom. Therefore it can be used as a decision making technique. (6) Principles of Management: The principle of management can serve as a useful guide in making decisions. (7) Economic and Financial Techniques: Marginal analysis, break even analysis, utility analysis etc are some of the most important economic techniques of decision making. Pay back analysis, inflow outflow analysis, ratio analysis are some of the financial techniques of decision making. (8) Linear Programming: It is a mathematical technique of limited resources. It helps in making decisions regarding allocation of limited resources among various competing demands in an optimum way. (9) Game Theory: In this technique, one member chooses one such course of action that frustrates and defeats the action of the competing member and help him in wining the game. This technique used under competitive and conflicting situations. (10) Waiting Line or Queuing Theory: This technique is used to decide problem of waiting line in an organization with the help of the technique, manager decides optimum rate of flow through service points by balancing the cost of making customers wait against the cost of servicing them more rapidly. (11) Simulation: Simulation is a technique for studying and analyzing behaviour of a system under several alternative conditions in an artificial setting. (12) Network Techniques: PERT and CPM are the techniques that helps managers in deciding a logical sequence of activities required for completing a complex project. (13) Heuristic Technique: It is an trial and error technique of finding solutions to a complex problem by breaking it into small components. (14) Participative Techniques: It is a technique of making decisions with the participation of the employees. This technique encourages industrial democracy. 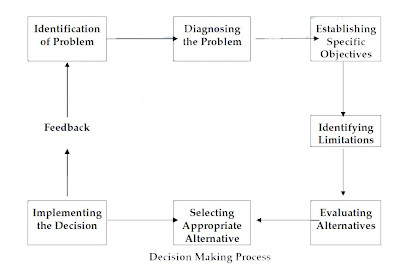 Q.3 Draw a flow diagram of process of Decision Making.